Get ready for the Second Formic War – THE SWARM is now out on Audio! For Ender’s Game fans this is especially exciting news… The Swarm – is now out on audio! The Swarm is the first novel in the Second Formic War Trilogy and the Prequel Trilogy to the Original Ender’s Game!! I had so much fun being back with the amazing team at Skyboat Media where I had the joy of playing nun/biochemist Wila in this exciting multi-voiced project! 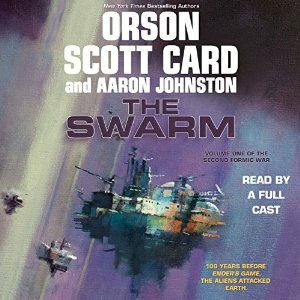 Written by Orson Scott Card and Aaron Johnston, The Swarm is produced by Skyboat Media and published by Macmillan Audio. This entry was posted in Audio Books, Narration, News, Press and tagged Skyboat Media; Macmillan Audio; Orson Scott Card; Aaron Johnston; Susan Hanfield; Ender's Game; Ender's Game Alive; Science Fiction; Second Formic War; Audiobook. Bookmark the permalink. ← Two Pawns. Two Eternal Adversaries. Who will win? – The Game of Love and Death – now available on Audio!